CVGHM lowered the Alert Level for Sorikmarapi on 30 December from 2 to 1 (on a scale of 1-4). On the morning of 5 May 1996, Qantas Airlines reported "smoke" over Sumatra near Sorikmarapi to just above 10 km altitude. However, in a satellite pass about 2 hours earlier there was no evidence of an eruption.
. . . on 5 July at 1520, a large dark ash plume was observed from Sibangor Tonga observation post. No additional explosions were recorded on 5 or 6 July. The ash plume from the 5 July explosion reached 700 m above the summit. No additional explosions have been recorded. Temperatures increased at two fumaroles during August: from 104 to 197°C at the N crater, and from 95 to 108°C at Sibangor Julu. White fume was almost continuously present, rising to ~100 m above the crater. In late August, seismic activity began to increase. By early September, near-surface earthquakes averaged ~7/day and deeper, tectonic earthquakes averaged ~40/day. Normal activity continued in late July, with a weak gas plume reaching 5-10 m above the crater. The temperature of the crater solfatara was 185-190°C, while two surrounding solfataric areas measured 108-110°C and 97-115°C. Twenty-nine tectonic earthquakes (but no volcanic shocks) were recorded. Sorikmarapi is a forested stratovolcano with a 600-m-wide summit crater containing a lake and substantial sulfur deposits. A smaller parasitic crater (Danau Merah) on the upper SE flank also contains a crater lake; these two craters and a series of smaller explosion pits occur along a NW-SE line. Several solfatara fields are located on the E flank. Phreatic eruptions have occurred from summit and flank vents during the 19th and 20th centuries. There is no Deformation History data available for Sorikmarapi. There is no Emissions History data available for Sorikmarapi. 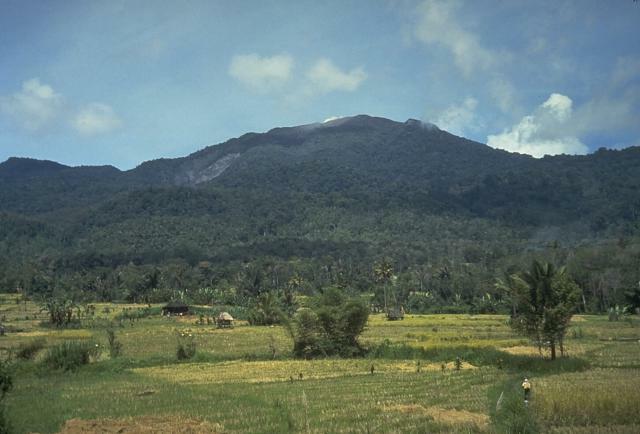 Sorikmarapi, seen here from the west, is a forested stratovolcano with a steep-sided, 600-m-wide summit crater containing a crater lake and substantial sulfur deposits. Another crater lake is located on the upper SE flank and several small explosion craters occur within the main crater and on the outer flanks. Small explosive eruptions have been documented from summit and flank vents in the 19th and 20th centuries. 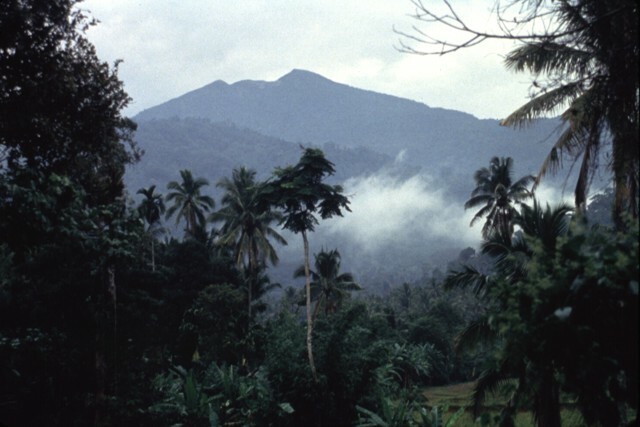 Sorikmarapi volcano rises above older mountains that have impeded its growth to the north. The truncated summit contains a crater lake and a chain of smaller NW-SE-trending craters. Historical eruptions have been recorded from both summit and flank vents since the 19th century. There are no samples for Sorikmarapi in the Smithsonian's NMNH Department of Mineral Sciences Rock and Ore collection. IRIS seismic stations/networks Incorporated Research Institutions for Seismology (IRIS) Data Services map showing the location of seismic stations from all available networks (permanent or temporary) within a radius of 0.18° (about 20 km at mid-latitudes) from the given location of Sorikmarapi. Users can customize a variety of filters and options in the left panel. Note that if there are no stations are known the map will default to show the entire world with a "No data matched request" error notice. Large Eruptions of Sorikmarapi Information about large Quaternary eruptions (VEI >= 4) is cataloged in the Large Magnitude Explosive Volcanic Eruptions (LaMEVE) database of the Volcano Global Risk Identification and Analysis Project (VOGRIPA).